No matter what your feelings about the art of mime, the passing over the weekend of the legendary Marcel Marceau marks the end of an era. I almost--I repeat, almost--had the chance to work with him two decades ago, and the story of how it all went down was one of the funniest in my former career running the Just For Laughs Festival. "He was the living definition of mime. I was a young punk producing his first major TV special. Heading towards each other on a collision course, we became involved in a high-stakes game of chicken. Who will be the first to jump off? The answer will surprise you. In 1988, we booked Marcel Marceau for a rare concert appearance in Montreal as part of the festival. To help amortize our costs, we added Marceau to the lineups of both our French and English galas. And, as a further tribute, we also included him in our HBO special. Host John Candy was thrilled when he heard the news. Everything went perfectly on the French side. 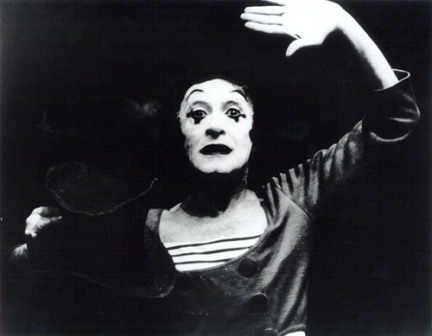 Showcasing routines from his more than forty years in the limelight, Marceau was showered with adulation. While his act was a little slow for some people's taste, most felt that seeing him live was a treat. Unfortunately, that treat would not be shared by our English audience. At the rehearsal for the English show, Marceau was appalled to see that the stage he had performed on earlier in the week had been altered to accommodate Leo Yoshimura's elaborate HBO set, which included a majestic checkerboard square at centerstage, a platform that was not only cut into the floor, but also rose above it by about a quarter-inch. This diminutive elevation may seem like nothing to you and me, but to Marceau's sensitive steps of silence, it was Mount Everest. And he wasn't willing to climb it. Ooops. Bad association. Comparing the man whose name is synonymous with silent expression to a bunch of street jugglers was like comparing a fine French champagne to a boxed Bartles & James wine cooler. I had touched a raw nerve. I couldn't fathom what had just occurred. I had basically booted the great Marcel Marceau off a stage. Although I did my best to bring him back, there was to be no compromise, no negotiation. He was gone forever. To this day, I'm embarrassed about the result of our confrontation, but that cloud had a silver lining. How many other people on earth can say that Marcel Marceau, the Sultan of Shhhhh, actually raised his voice to them?" Uh...rest in peace, Mr. Marceau.